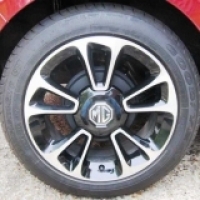 In normal use I have always found rear discs glaze up and even seize through under use. They are really only needed if you are going racing - apologies of course if you are contemplating a needed 200HP conversion ! 4 week wait for timing chain kit parts. Thanks for your detailed reply - so the plot thickens! What is going on??? My "3" is at around 24K now and all running as new. Interesting you found the timing chain layout, I haven't managed to find anything at all about this 'MG' engine - I reckon it must be on the secret list ! Can you verify that the car was serviced at the correct time with the right oil? Impending problem with my 3. Listening to the exhaust noise, it sounds as if its 'hunting'. I had something very similar on my MGF when a mechanic had fitted a new cam belt - one tooth out..! Has your problem been solved yet? My garage found this connector under the driver's seat was causing the airbag light to come on. They pushed it together which solved the problem for a bit but it soon came on again and now I keep giving it a wriggle and a shove to fix it. What is wrong with this connector? Can anybody tell me how to get at the thing as its near impossible reaching under the seat and is it possible to un-clip the thing from the seat to get a better look? The 4 years scheduled plug life is probably based on the fact that the vehicle will be doing an estimated 15,000miles/year. So these are expensive plugs designed to last for 60,000 miles so why not use this advantage. Before this type of plug they would be changed every year / 12,000 miles. Those plugs have been in my classic MG for years but they won't have done 12K yet. You can't damage your engine with old plugs. When plugs start to fail you could have difficulty starting or some sort of misfire on acceleration. Let's see if we can get our low mileage MG3s through their 4th year service without a plug change. If there is any news - let us know. They appear to be listed as MG Pt.No. NLP000130 costing over £60. I have had a search on-line for any equivalents and have found it all very inconsistent. Can anybody else help? It appears the garages get in a set of service parts from MG Motor which would include the plugs for the 4th year service. Presumably making it an expensive set of bits. According to the schedule the plugs need replacing at 4 years or 60,000 miles. I estimate my mileage will be <=24,000mls at 4 years. Why should I change plugs then? My MGF still has the original untouched plugs in at 50,000mls and is 18 years old now... Those are supposed to last 60K mls too. Hope your situation is now resolved Gareth. I appreciate it is now irrelevant but this thread reminded me that we once had a beautiful red new Alpha Romeo Alphetta which got covered in hard black spots when parked at a factory that made large diesel boilers. Apparently they had been experimenting with a burner which had emitted these horrid black particles which chemically stuck in the paint of all the cars in the car park! They accepted liability and the only way was to have the cars T-cut and polished - I was not a happy bunny at the time. In your case I just wondered if it could possibly have been from train engines' diesel exhaust..?? ?